The UK is the "dustbin of Europe", according to a new study. The UK dumps more household waste into landfill than any other country in the European Union, research by the Local Government Association shows. UK households sent 22.6 million tonnes of rubbish to landfill in 2004/5 - the most recent year for which comparable figures are available across the EU. However, government figures for 2006/7 show households recycled record amounts and levels of landfill waste fell. Between 2005/6 and 2006/7, the proportion of household waste which was recycled or composted rose from 27.1% to 30.7%, according to the Department for Environment, Food and Rural Affairs. And the amount being sent to landfill fell from 17.9 million tonnes to 16.9 million tonnes. The LGA said that indications were that other European countries had also cut their landfill amounts since 2005, leaving the UK still "at the top of the rubbish heap". The UK came top in 2004/5 for overall amount of rubbish dumped, but third behind Bulgaria and the Irish Republic when the amount per head of population was calculated. 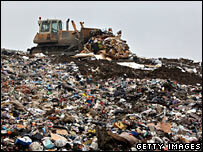 The LGA warned that an area of 109 square miles was already used as landfill in the UK. The association, which represents councils in England, said that if the current trend continued, the UK could run out of landfill space in under nine years. The figures for 2004/5 show the UK sent the same amount of rubbish to landfill as the 18 EU countries with the lowest landfill rates combined, despite those countries having almost twice the population. The other countries with the highest amount of household rubbish thrown into landfill were Italy at 17.6 million tonnes and Spain at 14.2m. France sent around 12 million tonnes to landfill, Poland 8.6m and Germany 7.3m. The LGA said bold reforms on rubbish disposal were needed otherwise recycling rates will not rise fast enough to meet the EU Landfill Directive. The directive sets the UK a number of targets, including that by 2020 the amount of biodegradable municipal waste, including household rubbish, sent to landfill should be no more than 35% of the amount produced in 1995. In the future, councils, and consequently the taxpayer, are facing fines of up to £150 per tonne of rubbish over their "allowance" that is sent to landfill sites. Paul Bettison, chairman of the LGA's environment board, said: "For decades people have been used to being able to throw their rubbish away without worrying about the consequences. Those days are now over. "Local people, businesses and councils all have a vital role to play to protect our countryside before it becomes buried in a mountain of rubbish." He said it was encouraging to see that people were recycling more, but added: "The fact remains other countries on the continent are still recycling up to twice as much." A spokesman for the Department for Environment, Food and Rural Affairs acknowledged the need to do more. It said: "We still lag behind much of Europe and we cannot afford to be complacent. We need to keep raising our performance if we are to meet future challenging landfill targets."